And at Oregon State University – just 45 miles north of my university – senior instructors are reshaping biology education. They are assigning their students projects to create their own media content and to share their stories across their class social media channel. There is an ever-increasing importance for all students, including those studying science and not just those in creative curriculums, to learn how to become storytellers and curators of digital media. Drader advises farmers to follow stripe rust reports from their retailers, Oregon State University and USDA Agricultural Research Service. USDA ARS research plant pathologist Xianming Chen predicts an 18 percent yield loss to stripe rust on susceptible wheat varieties. Smart Grid Lecture: Please join us for the first IEEE PES Student Chapter event of spring term where we will be having guest speaker Darren Murtaugh, the manager for the T&D planning group at Portland General Electric, talk about Smart Grid and the industries progress in that field. The presentation is scheduled to start at 10 a.m. Thursday, April 5, in KEC 1007. Please contact Brandon Johnson at johnbran@oregonstate.edu for additional information. TRIAD meeting: Michelle Barnhart and Aimee Huff, from the College of Business, will talk about gun violence and the many paths to prevent it. The meeting will begin at noon on Thursday, April 5 in MU 211. The public is welcome to attend free of charge. An optional catered lunch is available for $13. Contact Jeannine Cropley, Jeannine.cropley@cgrb.oregonstate.edu to reserve a lunch. 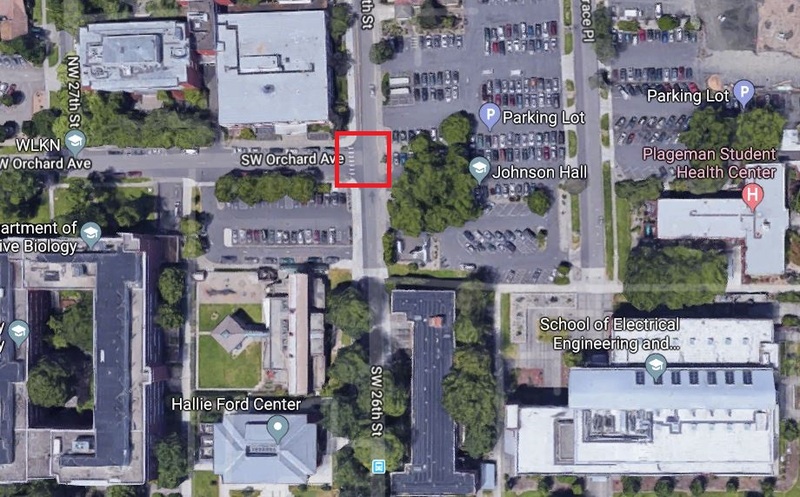 Active shooter scenario: The College of Public Health and Human Sciences will host an interactive workshop on what to do in an active shooter situation on campus, led by Oregon State Police. April 5, 2-3:30 p.m., in Milam Auditorium, Attend to learn how to prepare for – and respond to – an active shooter situation. This event is being hosted in recognition of Public Health Week, April 2-8. Undergraduate Mathematics Colloquium: Clifford Stoll, chief bottle washer at Acme Klein Bottles, will present “Fun With Low Dimensional Topology” on Thursday April 5, 4-5 p.m., Kidder 364. Prerequisites: A curious mind and a sense of humor. The Religious Impossibility of Queer Freedom: Thinking about Trans* Life in the Age of Transparent: Lecture by Kathryn Lofton. This talk uses the television series Transparent as a laboratory for the reconciliation of two trajectories of symbol and law, for the figuring out of trans bodies as religiously potent and the role of religions in the assignment of gender norms. Lofton is Professor of religious studies, American studies, and history; chair, religious studies; and deputy dean for diversity and faculty development at Yale University. Thursday, April 5, 4 p.m., MU 206, Asian/Pacific-American Room. Catalyzing the transformation of science learning at OSU, April 5: The 2018 F.A. Gilfillan Memorial Lecture will be “Catalyzing the transformation of science learning at OSU” by professor of physics Corinne Manogue. She will use her experiences leading the successful curriculum redesign of the physics major as a model to explore learning reform in STEM. April 5, 6:30-8 p.m., LInC 100. Film screening: Senior Instructor Shelley Su will lead a film screening and discussion along with the Public Health Club on the film Flow: For Love of Water. April 5, 5:30-8:30 p.m., in Waldo 400, Pizza will be available on a first-come, first-served basis. R.S.V.P here. This event is being hosted by the College of Public Health and Human Sciences in recognition of Public Health Week, April 2-8. NEW! Spring Preview: On Friday, April 6, from 7 a.m. to 5 p.m. an open house program for prospective students and their families will take place in the Memorial Union and the CH2M Hill Alumni Center. There will be approximately 1,200 visitors on campus, which may affect parking and retail food locations. Please help us welcome our guests on campus. NEW! Sun Grant kickoff in the Quad: OSU150 Sun Grant Festival kicks off in the MU Quad April 9, 11 a.m. to 2 p.m. Check out how to make ethanol from grass straws and collect 100 points for the OSU150 phone app scavenger hunt. Learn more about all the festival activities. BEavers HERE NOW Drop-In Meditation: No experience necessary. All are welcome. Benefits of mediation include: Stress reduction, better sleep, sharper concentration, anxiety management and happier relationships. Mondays-Thursdays at 3:30 p.m., Callahan 125 classroom (outside entrance behind Dumpsters). Contact tess.websterhenry@oregonstate.edu to coordinate extra credit for student attendance. Music a la Carte: ensemble demitasse (Hui Wu, piano and Cameron O’Connor, guitar) open the spring season with works by Boccherini, Beethoven, Castelnuovo-Tedesco, Bach, de Falla and Lee. Friday, April 6, at noon in the Memorial Union Lounge. Free. OSUsed Store Public Sales: The OSUsed Store is open for its weekly public sale Friday noon to 3 p.m. at 644 S.W. 13th. Personal purchases must be made during public sales. Staff may shop for their department 8 a.m. to 4 p.m. Mondays through Thursdays. More information on our website. OSU Math Club presents Comedian Sammy Obeid: All are invited to a free comedy show. Voted “Fastest Rising Star” of 2014 in Campus Activities Magazine, Sammy has appeared on NBC’s Last Comic Standing, America’s Got Talent, TBS’s Conan. Friday, April 6, at 6 p.m., in Kidder Hall 364. Details at https://math.oregonstate.edu/comedian_sammy_obeid or see flyer here. Admission is free to all OSU students, faculty and staff. Poet presentation: Portland-based poet Anis Mojgani, a two-time National Poetry Slam champion, will perform on Friday, April 6, at 7:30 p.m. in the Lab Theatre in Withycombe Hall on the Oregon State University campus in Corvallis. A question-and-answer session and book signing will follow. The event is free and open to the public. A Celebration of the life and love of Loril Chandler: A celebration of life for longtime OSU colleague Loril Chandler, who passed away in February. April 7, 2 p.m., Withycombe Hall Main Theatre, corner of 30th and Campus Way. Reception to follow. Clock Tower Wind Orchestra: OSU director of bands Chris Chapman leads the inaugural performance of a newly-formed professional wind band in a program of works by Leonard Bernstein, Percy Grainger, Andreas Makris and more! Sunday, April 8 at 3 p.m. in the Austin Auditorium at The LaSells Stewart Center. Free and open to the public, no tickets required. RSVP kindly requested. Ettihad Cultural Festival: Join the Ettihad Cultural Center to celebrate the sixth annual Ettihad Cultural Festival featuring more than 15 countries from southern, southwestern and central Asia and northern Africa. On Sunday, April 8, from 5 to 8 p.m. come experience the various cuisines, languages, performances and clothes of this culturally diverse region, all for free. Faculty/Staff Meningococcal B Vaccination Clinic: April 9 from noon to 5 p.m. and April 10 from 8 a.m. to noon, MU109. Register at Meningococcal B Vaccination Clinic Signup – OSU Faculty/Staff. Samaritan Health will bill individual and employer health plans. PEBB health plans accepted: PEBB Statewide, Providence Choice and Moda. Employees with Kaiser plans will need to pay at the time of service and request reimbursement from Kaiser. For questions, contact employee.benefits@oregonstate.edu or 541-737-2805. NEW! Microbiology Student Association 2018 Research Symposium: Keynote speaker Scott Wong will speak on“Deciphering How Oncogenic Viruses Establish Persistent Infection and Disease.” Other presenters include: Sandra Loesgen, Aleksandra Sikora, Frederick Colwell and Lia Danelishvili, all of OSU, Fikadu Tafesse of OHSU, Bruce Bowerman of UO, Justin Courcelle of PSU and Jay Mellies of Reed College. April 7, 9 a.m. to 5 p.m., Kearney Hall 112. Free Admission. NEW! CEOAS climate talk: A special science lecture in the College of Earth, Ocean, and Atmospheric Sciences will be presented by Ben Santer from the Lawrence Livermore National Laboratory (LLNL). “Fingerprinting the Climate System” will take place from 4 to 5 p.m. Monday, April 9, in Gilfillan Auditorium. Santer is an atmospheric scientist at LLNL. His research focuses on such topics as climate model evaluation, the use of statistical methods in climate science, and identification of natural and anthropogenic “fingerprints” in observed climate records. NEW! Fragments of the Uni-versatile Subject: Flexibility and versatility are often praised as positive skills — qualities to cultivate and admire. Yet flexibility is a central feature and cultural consequence of neoliberal economics and globalization. In this talk, H Rakes will discuss the implications of flexible subjectivities: Do we become more or less accountable to each other as the universal subject becomes the uni-versatile? Rakes is an assistant professor of Women, Gender, and Sexuality Studies at OSU and a 2017-18 Center for the Humanities Research Fellow. Monday April 9, 4 p.m., Autzen House, 811 S.W. Jefferson Ave.
NEW! Anti-Semitic propaganda talk: A public talk by Randall Bytwerk, “Building Hatred from a Firm Foundation: Anti-Semitic Propaganda in Nazi Germany.” Monday, April 9, 7:30 p.m., Horizon Room, OSU Memorial Union. Bytwerk is known for creating a widely used digital archive of Nazi and East German propaganda, and for his biography of Julius Streicher, the publisher of a virulently anti-Semitic tabloid before and during the Nazi period. In his talk, Bytwerk will discuss how Nazis used the media to raise the level of hatred toward Jews in Germany. NEW! Conversational skills: Paul Axtell is back the week of April 16 to present Conversational Skills and follow-up/refresher courses! These learning experiences promote conversational ideas introduced under the W.K. Kellogg Foundation-funded InterACTION! project. Conversational Skills is the basic training and refresher courses reinforce earlier learning. Conversational Skills details and registration | Refresher courses details and registration (for those who attended Conversational Skills in a previous year). NEW! OSU Health and Safety Committee: The University Health and Safety Committee would like to invite campus members interested in health and safety to attend our open meetings, held semi-annually in May and October. Meetings are held on the fourth Wednesday of the month from 2:30 to 4 p.m. Anyone can access OSU’s University Health & Safety Committee online at http://oregonstate.edu/ehs/casc, including past meeting minutes, information on how to contact a committee member, and a web link to report safety concerns. If you are interested in attending the May meeting or would like additional information about the Safety Committee, please contact Kay Miller at Kay.Miller@oregonstate.edu to RSVP and request the meeting location. Board of Trustees: The OSU Board of Trustees will meet on Friday, April 6, from 11 a.m. to 3 p.m. in the Horizon Room of the Memorial Union to consider tuition rates, mandatory fees and student incidental fees for the 2018-19 academic year and 2018 summer session and hear updates to the educator equity plan. A legislative update will also be received. A public comment period is provided at each board meeting. Commenters may register by e-mail before the meeting by emailing board.support@oregonstate.edu or may register at the meeting itself. There is also a public comment opportunity before the board votes on each action item listed on the board agenda. On Friday, April 6, the board will host a forum on Strategic Plan 4.0 in the Robert Family Event Room, Austin Hall, from 9:15 to 10:45 a.m. Committees of the board will meet from 8:30 a.m. to 4:30 p.m. on Thursday, April 5, in the Horizon Room of the Memorial Union. Board and committee meetings are open to the public. Participation in Friday’s forum will be limited to invited guests but members of the public may attend. The agendas and meeting materials will be posted as they are available at http://oregonstate.edu/leadership/trustees/meetings. For accommodations: 541-737-7740 or board.support@oregonstate.edu at least 48 hours in advance. Beyond Cultural Competence will provide skills and strategies for white faculty mentoring underrepresented racial and ethnic groups. Join us from 2:30 to 4:30 p.m. Friday, April 6, in LInC 128 for an engaging discussion by Cheryl Franks, Ph.D, who has spent 22 years consulting, training and serving as executive director of diversity, human rights and social justice at Columbia University’s School of Social Work. Sponsored by the College of Public Health and Human Sciences; Students for Equity, Inclusion and Diversity; and the colleges of Liberal Arts, Education, Agricultural Sciences and Business. Contact Kate MacTavish for more information and/or go here to register. CPHHS Distinguished Alumni Lecture: CPHHS alumna Alana Knudson, Ph.D., will deliver the college’s first Distinguished Alumni Lecture, “Adventures in Public Health: Taking the road less traveled.” Alana is program area director in the Public Health Department at NORC at the University of Chicago. She’s also co-director of NORC’s Walsh Center for Rural Health Analysis and has 20 years of experience directing public health programs, leading public health research projects and evaluating programs. Friday, April 6, from 1 to 2 p.m. in HFC 115/Bray Conference Room. A graduate poster session and reception will follow from 4:30 to 6:30 p.m. in HFC115 and the HFC lobby. These events are being hosted by the College of Public Health and Human Sciences in recognition of Public Health Week, April 2-8. Fourth Annual Pacific Northwest Undergraduate Religious Studies Conference: Saturday, April 7, 8-5 p.m. MU Journey Room 104. Keynote talk by Kathryn Lofton, Yale University, author of Consuming Religion, at 8:30 a.m.
Online Principles of Marketing Course for Administrators and Supervisors: Oregon State’s five-week professional development course equips leaders to make more informed marketing and communication decisions. Learn more. Register through April 9. Human Resources Fundamentals Online Course: This five-week course from Oregon State highlights human resource essentials such as recruitment, performance management, retention and more. Learn more here. Register through April 9. Permaculture Design Online Course: Learn how to develop a sustainable landscape for your farm, garden or land in this 10-week online certificate program. Limited space available in this popular Oregon State program. Register through April 9. Web Development and Coding Online Bootcamp: Oregon State’s flexible, affordable online courses feature web development career essentials such HTML, CSS, PHP, MySQL and more. Find out more. Register through April 9.
Business Writing Online Course: Strong writing improves your professionalism, makes you stand out in your field and may even improve your chances at securing a great job. This four-week course will improve your writing skills and allow you to practice essential business communication. Cost is $249. Learn more. Register through April 9. Managing Nonprofits Course: Part of the brand new Nonprofit Management Certificate, this five-week course allows you to explore the key aspects of founding and/or managing a successful nonprofit organization. Learn more here. Course starts April 9. Designing Education for Adult Learners Online Course: This six-week program is designed to help educators, program coordinators and others develop effective programs for adult learners. Find out more here. Free on-demand webinar – Career Opportunities in the World of Nonprofit Management with Sally Sorte: Watch on-demand and learn more about Oregon State’s online Nonprofit Management Certificate program. Watch now. Seminar on SBIR/STTR funding. The Advantage Accelerator and Oregon Best invite OSU researchers to learn more about SBIR/STTR funding opportunities with federal research agencies (NSF, NIH, DOD, DOE, etc.). April 20, 10 a.m., Memorial Union. These programs annually provide $2.5 billion for R&D projects, including translation of innovative academic research. Registration is free for all OSU personnel. For more information: Sanjai.tripathi@oregonstate.edu. Fair Housing: Past, Present, Future: April is the 50th anniversary of the Fair Housing Act, and the City of Corvallis is teaming up with Oregon State University on a special event to commemorate this important milestone. The event will take place from 7 to 8:30 p.m. on April 11 in Memorial Union Room 104. Sun Grant Festival: Join us for lunch during the OSU150 Sun Grant Festival. Eight scientists from around the Western U.S. will share Sun Grant Initiative funded work on April 16. Drop in for 20-minute presentations by each of them in the morning. Register for the free buffet lunch followed by a panel presentation by all of our speakers. At lunch, you can visit one-on-one with our guests and see student posters highlighting research into alternative energy that can reduce dependence on fossil fuels. What a great way to learn more about the sun grant and celebrate OSU’s 150th anniversary. NEW! Nominate your Hero: That person that makes your day, goes out of their way to get the job done, goes the extra mile, lights up the campus – here is your opportunity to recognize and celebrate their greatness. The Professional Faculty Leadership Association (PFLA) is seeking nominations for the Our Hero Award. PFLA membership is not required by either you (the nominator) or your hero (the nominee). Let us help you celebrate the everyday hero. Nomination is easy. Visit the PFLA Our Hero webpage today. Craft Center Spring Classes: Looking for new ways to be creative? Sign up for beginning and advanced Craft Center classes for staff, faculty, students and community members now through April 16, as space allows. Topics include pottery on the wheel, weaving, fused glass, screen printing, woodworking and more. Pick up a catalog at a number of convenient locations across campus or view the catalog online. Register for classes at the Craft Center. 541-737-2937. sli.oregonstate.edu/craft. CLA research awards: Thanks to a new partnership with the Center for the Humanities, two newly revised, internal funding programs for College of Liberal Arts faculty are open. Research Awards are intended to pursue creative, scholarly or research activities in the humanities and in the humanistic sciences. The Faculty Excellence Publishing Support and Special Travel Grant are intended to offset the costs of time-sensitive research and scholarship needs. For more information check out the Liberal Arts Research in Action blog or the CLA Research website or contact CLA Research Program Manager Eric Dickey. Volunteers sought for Marine Science Day: The annual, free Marine Science Day will take place at the Hatfield Marine Science Center in Newport on April 14, 10 a.m.-4 p.m. Bring the kids and learn about ocean observing technologies, watch videos about ocean acidification and deep ocean vents, and participate in a rubber ducky race, a fundraiser for Newport schools. Volunteers are needed to serve as greeters for two-hour shifts at Marine Science Day. They will be stationed throughout the hallways of HMSC and outside at exhibits and the entrance to help visitors find their way. Parent/child teams are welcome, as are family and friends. Sign up here or contact Renee Fowler at renee.fowler@oregonstate.edu or 541-867-0226. Food science winners: Congratulations to the OSU food science IFTSA college bowl (food science trivia) team. On March 31 they beat 5 other IFT chapters to become the 2018 Pacific NW champions. Team captain Danton Batty and his teammates Jordyn Bunting, Nick Engels, Rachel Hahn, Lauren Olson and Megan Ooi will be representing the pacific NW in the IFT national competition this July. Great job, team, and good luck at nationals! Students can complete a business minor in the summer: Oregon State offers students the opportunity to complete a minor in business and entrepreneurship in just two short summers. Classes are offered both on campus and online through OSU Ecampus during summer term, allowing students to mix and match to meet their needs. Learn more at summer.oregonstate.edu/business and share this information with students in your field. NEW! The LaSells Stewart Center: Due to an event at the LaSells Stewart Center, the LaSells Stewart Center West Lot (3277) will have 70 spaces reserved between 7 a.m. to 12:30 p.m. on Friday, April 6. NEW! 26th Street: Due to construction, the intersection at 26th Street and SW Orchard Ave. (see map) will be closed April 9-27 for excavation. Pedestrian traffic will not be impacted. Instructor – Computer Science: OSU-Cascades invites applications for two full-time (1.0 FTE), 9-month, Instructor – Computer Science positions. Posting #P01969UF. Full consideration April 6. Closes April 13. Faculty Research Assistant: OSU-Cascades invites applications for a full-time (1.0), 12-month, Faculty Research Assistant position. Posting #P01933UF. Closes April 6. NEW! Specialist 2 – Seed Certification 1 – Crop/Soil Science Extension, Oregon Seed Certification Service invites applications for a full-time (1.0 FTE), 12-month, Specialist 2 – Seed Certification 1 position. Posting #P02006UF. Closes April 8. NEW! Student Clerical: The National Pesticide Information Center (NPIC) is seeking a part-time (10-20 hrs./week) student to join their office for spring term and through summer. NPIC is housed within the Department of Environmental and Molecular Toxicology, and is a cooperative agreement between OSU and the US EPA. Posting #P03389SE. Closes April 8. The Office of Enrollment Management Information Technology is seeking an Operations Manager. This is a full-time (1.0 FTE), 12-month, fixed-term professional faculty position. Reappointment is at the discretion of the Information Technology Manager. Posting # P01967UF. Closes April 9. Oregon State University‘s University Housing & Dining Services (UHDS) is seeking to fill four Seasonal Custodian positions. These positions will be a part of the Operations unit providing custodial services that ensure a clean, healthy and presentable environment in all UHDS facilities. Custodians are committed to the overall success and satisfaction of UHDS students, customers, clients and guests and demonstrate this commitment through the work that they perform. Posting #P01437CT. Closes April 9. Enterprise Computing Services is seeking one Analyst Programmer, Comp Level 2 position for the Hyland Onbase project. This is a Classified Exempt position that is of limited duration (expected to last two years). Posting #P01386CT. Closes April 10. Assistant Director: Student Life OSU-Cascades is seeking an Assistant Director-Student Life. This is a full-time 1.0 FTE, 12-month, fixed-term professional faculty position. Posting #P01990UF. Full consideration April 11. Closes April 21. Student Health Services invites applications for a full-time (1.0 FTE), 9-month, Medical Assistant-Reception, Posting #P01462CT. Closes April 11. Facilities Services is seeking a General Maintenance Mechanic. This is a full-time (1.0 FTE) 12-month position. Posting #P01455CT. Closes April 11. The Office for Sponsored Research and Award Administration (OSRAA) is seeking a Business Systems Analyst. This is a full-time (1.00 FTE), 12-month, fixed-term professional faculty position. Reappointment is at the discretion of the Vice President for Research. Posting #P01994UF. Closes April 11. Student Clerical/Events Assistant: The College of Engineering Dean’s Office invites applications for part-time student positions. Posting #P03450SE. Closes April 11. ODS Outreach & Inclusion Coordinator: The Division of University Outreach and Engagement invites applications for a full-time 1.0 FTE, 12-month fixed-term Outreach and Inclusion Coordinator position. Reappointment is at the discretion of the Extension Service Assistant Director, Outdoor School Program Leader. Posting# P01993UF. Closes April 11. This recruitment will be used to fill one full-time Analyst Programmer, competency level 2, position for the Office of Enrollment Management Information Technology at Oregon State University (OSU). Posting #P01456CT. Full consideration April 12. Closes April 19. The College of Public Health and Human Sciences Dean’s Office is recruiting for an Executive Assistant to the Dean. This is a full-time (1.0 FTE), 12-month, fixed-term professional faculty position. Posting #P02009UF. Closes April 13. Oregon State University‘s Capital Planning and Development is seeking to fill two full-time (1.00 FTE), 12-month, fixed-term professional faculty Project Manager positions. These positions manage capital and non-capital projects across the university from inception to completion including the planning, design and construction phases. Posting #P01992UF. Closes April 13. The College of Agricultural Sciences is seeking a Student Engagement Coordinator. This is a full-time (1.0 FTE), 12-month, fixed-term professional faculty position. The Student Engagement Coordinator will work within the College of Agricultural Sciences (CAS) Academic Programs Office. Posting #P01985UF. Closes April 13. Accounting Technician: The Business & Engineering Business Center (BEBC) invites applications for two Accounting Technician positions. These are full-time, 12-month, classified positions. Posting #P01458CT. Closes April 13. Student Outreach Assistant: This recruitment will be used to fill one Student Outreach Assistant position for the Extension 4-H Youth Department at Oregon State University (OSU). This position will be located in Roseburg. Posting #P03529SE. Closes April 15. UPDATED! Controller: The Division of Finance and Administration invites applicants for a controller. Reporting to the vice president for finance and administration, the controller is responsible for maintaining an effective and compliant accounting and financial system, along with related policies and business processes, that support the mission of the university. This is a full-time (1.0 FTE), 12-month position. Posting #P01975UF. Closes April 15. Assistant Director of Research Communications/Terra Editor: Oregon State University – University Relations and Marketing invites applications for a full-time (1.0 FTE), 12-month, professional faculty position. Posting #P01974UF. Closes April 15. The Office of Audit Services is seeking an executive assistant. This is a full-time (1.0 FTE), 12-month, fixed-term professional faculty position. Reappointment is at the discretion of the chief audit executive. Posting #P01996UF. Closes April 15. The Office of Enrollment Management is seeking a Student Services Manager for Transfer Students. This is a full-time (1.0 FTE), 12-month, fixed-term professional faculty position. Reappointment is at the discretion of the Associate Provost. Posting #P01984UF. Closes April 15. Client Services is seeking a Product Manager. This is a full-time (1.0 FTE), 12-month, fixed-term professional faculty position. Reappointment is at the discretion of the Director. Posting #P01978UF. Closes April 15. Temporary Lifeguard: This recruitment will be used to fill two part- to full-time seasonal Temporary Lifeguards for the Oregon 4-H Center of Oregon State University (OSU). These positions will be located in rural northeast Salem, Oregon. Posting# P01446CT. Closes April 15. Senior Graphic Designer: This recruitment will be used to fill one full-time Senior Graphic Designer position for OSU-Cascades. Posting #P01452CT. Closes April 16. Certified Veterinary Technician: Oregon State University’s (OSU) Lois Bates Acheson Veterinary Teaching Hospital seeks a Part-Time Certified Veterinary Technician (VT2) for employment in our Large Animal Hospital. Posting #P01460CT. Closes April 17. Academic Technologies is seeking a Bridge Product Manager. This is a full-time (1.0 FTE), 12-month, fixed-term professional faculty position. Reappointment is at the discretion of the director. Posting #P01991UF. Closes April 17. NEW! Human Resource Consultant 1: The Office of Human Resources is seeking a Human Resources Consultant 1. This is a full-time (1.00 FTE), 12-month, fixed-term professional faculty position. We are members of a seven-person human resources team that provides generalist HR services to four academic colleges at Oregon State University. To review full job listing and to apply, please visit Posting #P02007UF. Posting closes April 18. NEW! Accountant 2: University Shared Services Enterprise (USSE) in Corvallis invites applications for one full-time (1.0 FTE), 12-month Accountant 2. Posting #P01479CT. Full consideration date April 20. Closes May 31. Grounds Maintenance Specialist: This recruitment will be used to fill one full-time Grounds Maintenance Specialist position for OSU-Cascades. Posting #P01466CT. Full consideration April 20. Closes May 4. Administrative Coordinator: The Division of University Outreach and Engagement (O&E) is seeking an Administrative Coordinator. This is a full-time (1.0 FTE), 12-month, fixed term professional faculty position. Reappointment is at the discretion of the Vice Provost for University Outreach and Engagement. Posting#P02012UF. Closes April 20. The Office for Sponsored Research and Award Administration is hiring one full-time (1.00 FTE), 12-month, Fiscal Coordinator 1 position. Posting #P01457CT. Closes April 22. The Office of Admissions is seeking a Program Coordinator-Welcome Center. This is a full-time (1.0 FTE), 12-month, fixed-term professional faculty position. Reappointment is at the discretion of the Director. Posting #P01980UF. Closes April 22. The School of Mechanical, Industrial and Manufacturing Engineering invites applications for a part-time, student hourly Student Marketing and Communications Assistant position. Posting #P03532SE. Closes April 23. Education Program Assistant 2: Oregon State University (OSU) Extension Service 4-H Youth Development program, affiliated with the College of Public Health and Human Sciences, invites applications for a full-time Education Program Assistant 2 (EPA2) located in Redmond in Deschutes County. Posting #P01436CT. Closes April 23. Accounting Technician: The Health Sciences Business Center (HSBC) invites applications for an Accounting Technician position. This is a full-time, 12-month, classified position. Posting #P01459CT. Closes April 29. Education Program Assistant 1: This recruitment will be used to fill one part-time (approximately 16 hours per week) Education Program Assistant 1 position for the Extension Douglas County Office at Oregon State University (OSU). This position will be located in Roseburg, Oregon. Posting #P01471CT. Closes April 29. Assistant/Associate Professor: The College of Business invites applicants for a full time (1.0 FTE) 9-month tenure-track Assistant or Associate Professor position (depending on qualifications). Position will teach undergraduate and graduate courses in Operations Management/Supply Chain Management. Posting #P01929UF. Closes May 1. The Center for Genome Research and Biocomputing is hiring full-time (1.00 FTE), 12-month, Biocomputing Systems Engineer position. Posting # P02005UF. Closes May 31. Custodian This recruitment will be used to fill future, full-time needs for custodian position openings at OSU-Cascades. Posting #P01465CT. Closes June 30. ABE Teacher: The College Assistant Migrant Program (CAMP) is seeking an ABE Teacher. This is a part-time, .49 FTE, 9-month, fixed-term professional faculty position. Posting #P01530UF. Closes June 30. Assistant Director of Development (ADOD) College of Liberal Arts. The OSU Foundation is searching for an ADOD to focus on securing mid to major gifts, expanding the pipeline of major gift donors, and engaging CLA alumni, parents and friends. With more than 4,000 students, six schools and 22 majors, the College of Liberal Arts is key to transforming OSU into a prominent international research university, providing transformative learning experiences, and strengthening OSU’s impact in Oregon and beyond. Learn more or apply at www.osufoundation.org. Director of Development (DOD), Gift Planning. The OSU Foundation is searching for a DOD to provide planned giving services throughout the university, with a strong emphasis on cultivation, solicitation and closure of major planned gifts. The position is responsible to develop and implement comprehensive cultivation, solicitation and stewardship strategies for a portfolio of 125-150 individual prospects nationwide, with opportunities to advance donors’ interest in the priorities of the institution. Make 120 personal visits annually with planned giving prospects. Learn more or apply at www.osufoundation.org. Corvallis: “What are heavy? sea-sand and sorrow. What are brief? today and tomorrow. What are frail? spring blossoms and youth. What are deep? the ocean and truth.” ~ Christina Rossetti. Rain today, high of 58, low of 47. Rain tomorrow. Central Oregon: Rain today, high of 54, low of 38. Rain likely tomorrow. Newport: Rain today, high of 54, low of 50. Rain tomorrow.